Trombonist Audrey Ochoa is a rising star on the Canadian jazz scene. After having completed studies in classical trombone at the University of Alberta, Audrey began performing professionally across Canada and abroad as a member of multiple ensembles. Though never having formally studied Jazz or contemporary music, Audrey has found a home in composing her own tunes that often have a Latin feel, and definitely convey her sense of humour. PJ Perry describes Audrey as a real talent, and mentor and trombone master Hugh Fraser describes her as an inspired emerging artist that embodies the talent, inspiration and focus to make a major contribution at the highest level. Having worked with or shared a stage with jazz legends like Hilario Duran, PJ Perry, and Tommy Banks, Audrey has also played with international musicians like Lew Tebackin, Dan Akroyd and the Temptations. 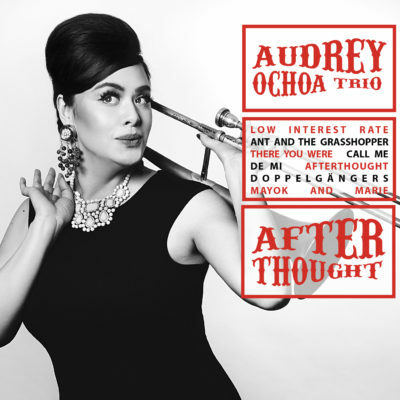 Audrey released her debut album Trombone and Other Delights in 2013, which spent consecutive weeks as the number one Jazz album on the Earshot charts and received excellent reviews. Audrey’s second album Afterthought, is an extension of her compositional skill and talent on her instrument. The project includes collaborations with Electronica artist Battery Poacher.